The men who worked the papyrus swamps of ancient Egypt were the ancient watermen who knew the swamps like the back of their hands. Each year it was the peasant farmer who was the miracle worker, the driving force behind the evolution of civilization, but as he spent more and more time working on projects for water control and Pharaoh’s monuments, he required more and more assistance from the specialists, the harvesters, the threshing crew, the marsh man who rounded up his cattle and set out with them on the long trail north into the Delta where dry season forage was to be had. 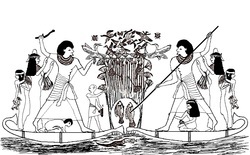 Many were also dependent on marsh men to provide skiffs, baskets, rope, fish, wildfowl and other food products from the swamp, or harvest papyrus for Pharaoh’s paper industry, or fuel for the Roman baths in Alexandria. Reality set in during Pharonic times with the advent of taxes, more community responsibility and social and political control. Egypt then was no longer the wild, wet country that encouraged marsh men, swamp dwellers and the Floating World. As history marched on, marsh men were still to be found, though in the minority. The mud brick house on dry land away from the mosquito-ridden swamp margins became more attractive to younger generations than the cabin of a floating skiff.